Are you at the career crossroads? Are you unsure about where your career is going? Maybe you are torn between security and fear of the unknown? Perhaps you think you don't have what it takes to make the leap? Considering a career change, let alone making it can be both exciting and scary all at once. 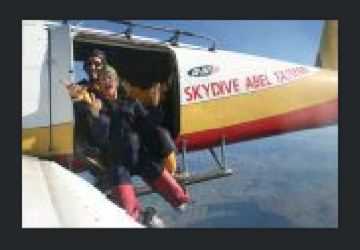 I liken it to a time when I did a tandem skydive. I knew I wanted to do one, but picking-up the phone to book felt like playing tag with a crab. I weighed up all the pros and cons... what if my parachute didn't open? What if the plane crashed? And how would I feel if I didn't do it? After weighing-up the odds of disaster versus delight, I made the call. I had made the decision...the next hurdle was to do it! Nerves came rushing-in as I was briefed for the jump. I was then kitted-out in stunning orange overalls, given a pair of plastic glasses that looked like one of Madonna's bras, then strapped in harnesses that made me look like one of my aunty's macrame pot-plant holders. I was bundled into a plane with a raft of other twittering tourists. As the plane circled its way higher into the clouds the people around me began to react differently; some laughed hysterically, others announced how scared they were, whilst others sat in stoney silence. When we reached the desired height 5029 metres (16500 feet), we were strapped to our jump instructor and shuffled across the floor towards the open door. I had weighed-up all the pros and cons, had done everything possible to ensure a safe jump...the rest was up to fate. As the instructor pushed me forward over the lip of the plane to rest on a step my feet dangled over the abyss below. I briefly faked a smile for the camera then waited for the count-down. Hanging there was scary, but I also knew that someone had my back (literally). I knew this was something that was going to change me. It would show me that I could overcome fear and do something I had always wanted to do. This was more than a jump to me; it was a metaphor for my life. 3,2,1 we were off! Arching my back and forming a star-like shape, we free-fell hundreds of metres before opening the parachute to playfully glide to earth. It was INCREDIBLE!! Making a career change can be just as scary as sky-diving. It requires you to weigh-up the pros and cons, link deeply with what you really want and need, and have a support network around you to keep you moving forward. I've been there, I get it. There have been times when I have had a false start, often doubting myself and scurrying-back to the security of the known. However, as much as I tried to ignore it, the yearning for change didn't leave me and I had to take the leap. It has been something that has challenged me on all levels. It has been delightful and scary all at once. But I know deep within myself, that this is ME. This is where I want to spend my energy, this is how I want to make a difference in the world. I haven't done it alone. I have had amazing coaches along the way who have both supported me and kicked my backside when I have needed it. They believed in me when I didn't believe in myself. Are you at the career crossroads? Do you want to take a different path? Do you need someone who has your back (as well as your backside)? Yes?? Contact me to chat through how I might support you to make the leap. Newer PostChange Management: Do you ‘Dump n’ Run’ or ‘Guide n Slide’? Older PostEmotional Wellbeing: Let's talk about it! !